Building Wrap What if you wanted to shout your message from the rooftops? Let absolutely every one who drives or walks by know all about your brand or product? For those of us more used to wrapping gifts than anything else, the idea of wrapping a building might seem strange… if not impossible. But new super-sizing technology allows just that. Park Press has the large format printing know how and equipment to translate your ideas and images onto on huge vinyl or PVC mesh banners up to 300 feet long! 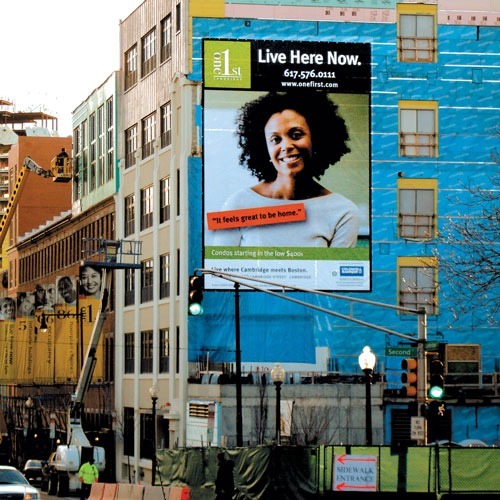 If you stop to think that a standard size billboard is about 48 feet wide, you’ll immediately understand the notice me potential of a building wrap. There are many steps to producing a great wrap. Design is key. Park Press can print from your own designs or work with you to develop eye catching art. Next, our grand format printers will transform your images from original art to wow! Park Press’ solvent inkjet machines are capable of producing brilliant perfect focused images. Of course, a quality building wrap needs to be made from a durable material. PVC mesh and vinyl can stand up to all kinds of weather. Edges are reinforced with special webbing for extra longevity. Banners can be securely attached with industrial strength adhesives or grommets.Building wraps are not the only alternative for extra-large projects. Wallscapes are smaller and less expensive but still have plenty of dazzle power. Think of wallscapes as classy billboards with striking graphics, created using 21st century technology. At Park Press, jumbo comes in more than one size. Whatever your choice, your banner will broadcast on durable materials and your message will be loud and clear. What are the best uses for building wraps? Building wraps are most often used for product launches, special events, trade shows, branding, publicity campaigns and other special advertising. Since they are much bigger than standard billboards, they command much more attention. Building wraps can be used on more than one side of a building, spreading your message in many directions. When would I prefer a wallscape? It’s a question of size and/or budget. If your display space is smaller or you are renting space and mindful of costs, a wallscape can be a more affordable alternative. Wallscapes can be installed indoors or out. Stadiums, arenas and exhibit halls often have dedicated space for wallscapes. How do I go about getting my building wrap or wallscape installed? Many buildings and venues are already equipped with attachment hardware, such as cables, scaffolding, truss systems etc. If these are not available, Park Press can supply them or coordinate installation with your chosen venue. How do I supply the art? If your art is ready to go, you can submit it electronically. Files set at 300dpi work best. Park Press can accept most file formats and our software will do a great job of enlarging your image. If you want help with the design, please get in touch with us directly to discuss your needs. What is the turnaround time for a building wrap or wallscape? After your artwork has been approved, Park Press can produce your building wrap or wallscape in about a week. Larger wraps that require multiple pieces may take longer. After you have settled on the ideal location for your building wrap or wallscape, you will need to coordinate installation with your city or town. Park Press can manage the process for you, including making sure your project meets city codes, applying for permits, and scheduling installation.